Home > Cabinetry and Counter Top Care	> What Should I Clean My Mica Cabinets With? What Should I Clean My Mica Cabinets With? Having been in the cabinetry industry for some time, a common question that many customers ask is, “what should I clean my Formica laminate cabinets with?” My answer is usually pretty standard, but in some cases my differ. Here’s why, there are several different finishes that come on the plastic laminate. If the customer is asking how to clean a counter top, it depends upon whether it is a gloss finish or a standard matte finish counter top. If the counter has a wood edge, I may suggest something different than if it has a regular laminate edge. Tip: When cleaning your plastic laminate covered doors, cabinetry or counters, always avoid over saturating any area with too much cleaner. Especially in the areas where there are seams. Not all cabinet makers use materials in seam areas that are non-absorbent. Beautiful counters can be ruined due to excessive amounts of any type liquid getting into seams. What shouldn’t I use when cleaning mica cabinetry? Never use cleaners containing acid, alkali, or sodium hypochlorite. These cleaners will mar, etch, corrode, and permanently discolor the laminate surface. Also, make sure that bottles, rags and other materials contaminated with these cleaners never contact the laminate surface. The following is a list from the Formica corporation of cleaners that should not be used. What cleanser should I use to clean mica with? Whether it is a matte finish or gloss for many years, I have recommended just using a light spray of glass cleaner and then wipe the surface immediately with a cotton cloth rag. Sometimes customers will have white counters and ask if they can use bleach on them. It is not recommenced by the Formica Brand Company. Review the list in the previous paragraph. The use of formula 409, fantastic, and even pine Sol is OK to use. You can let these sit over the stained area for a short length of time to draw the material out that is causing the stain. You may use baking soda but do not rub the material on the counter. Just use it in a paste form and give it a few moments to draw the substance out of the plastic. Some materials such as news print and pen ink may not be removable. Tip: Please note that hair dyes will permanently damage your plastic laminate counter tops. 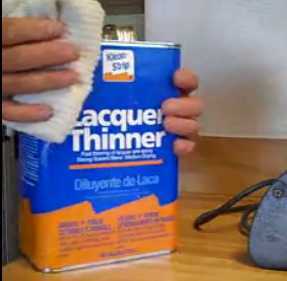 The standard cleaner that we have always used in our cabinet shop is lacquer thinner. This will certainly stink up the house if your cabinets are already installed, but it will also remove the glue. By the way, lacquer thinner will cut through grease around stove areas with ease. I hope this has helped answer your questions about how to clean or what to use for cleaning Formica counters. The Formica company has an entire article that lists in great detail certain ways to remove specific types of stains. They also have materials that they recommend to clean cabinetry parts with that we have not listed here. Plastic laminate is an absorbent material, so be careful at all times with what you do on them. If you can care for your mica laminate cabinets properly, they have the potential to last a lifetime. Choose the best cleansers from our list and your mica laminate will stay clean and beautiful for many years to come.